Kate Chapman, holding the Free Software Foundation 2018 award for projects of social benefit, together with FSF founder and president Richard Stallman, who presented the award during LibrePlanet 2019. Copyright © 2019 Madi Muhlberg, CC-BY 4.0. Image modified. “The FSF’s Award for Projects of Social Benefit honors projects that have taken the ideals of the free software movement and applied them to intentionally and significantly benefit society in other aspects of life. OpenStreetMap’s use of free software, freely shared data, and international grassroots collaboration has massively benefited not only the daily lives of individuals around the world but also saved lives through humanitarian uses like improved disaster response. We all owe OpenStreetMap contributors a debt of gratitude, and the FSF is happy to show our appreciation through this award”, said FSF executive director John Sullivan. Nominations for the award were collected from the public, and then a committee made up primarily of previous winners voted between them. OpenStreetMap is in good company, with previous winners including Tor, Public Lab, SecureDrop, Library Freedom Project, Wikipedia, GNU Health, Creative Commons, the Internet Archive and others. More background information about the award is at https://www.fsf.org/awards/sb-award. the award belongs to you! 2019-03-30 The post was updated to reflect that the award had on its label the four reasons why OpenStreetMap was nominated, and not the Free Software’s Four Freedoms, as initially mentioned. OpenStreetMap was founded in 2004 and is a international project to create a free map of the world. To do so, we, thousands of volunteers, collect data about roads, railways, rivers, forests, buildings and a lot more worldwide. Our map data can be downloaded for free by everyone and used for any purpose – including commercial usage. It is possible to produce your own maps which highlight certain features, to calculate routes etc. OpenStreetMap is increasingly used when one needs maps which can be very quickly, or easily, updated, such as ambulance services, fire brigades and humanitarian crises response. The Free Software Foundation (FSF) is a nonprofit with a worldwide mission to promoting computer users’ right to use, study, copy, modify, and redistribute computer programs. The FSF promotes the development and use of free (as in freedom) software — particularly the GNU operating system and its GNU/Linux variants — and free documentation for free software. LibrePlanet is an annual conference hosted by the Free Software Foundation for free software enthusiasts and anyone who cares about the intersection of technology and social justice. LibrePlanet brings together software developers, law and policy experts,activists, students, and computer users to learn skills, celebrate free software accomplishments, and face challenges to software freedom. This entry was posted in Uncategorized on March 27, 2019 by OpenStreetMap. The EU Copyright Directive threatens OpenStreetMap and our freedom on the internet. Please join the protest! If you are not located in the EU please spread the word! Call your MEP: Phone numbers and assistance. A day of protests will take place in more than 30 cities all over Europe on 23 March. Please join a demonstration! Locations and dates. On 26 March 2019, the European Parliament will vote for a third time on the new EU Copyright Directive. Article 13 of the new directive will de-facto force content platforms to filter uploaded contributions by their users. If a platform does not prevent uploading of copyright-protected content in accordance with “high industry standards of professional diligence” (i.e. upload filters), the operator of the platform is liable for copyright violations of their users. The new rules can be met by the large platforms, such as Google, Youtube and Facebook. Small, independent and free platforms like OpenStreetMap would be forced to introduce such filters or face catastrophic liability. This threatens our project. The European Parliament passed the bill on 12 September 2018 despite noticeable civil society protest. Since then, the European Commission, the Council of Europe and representatives of the parliament, negotiated a compromise. It is expected that the parliament will vote on the compromise in the last week of March. We think that passing the bill would harm the OpenStreetMap and many other small and medium-sized platforms – regardless of whether they are commercial or not. If OpenStreetMap had to invest more resources on pre-filtering content than on anything else, the project would be a shadow of its former self. If nothing changes, a dark future awaits us. The OpenStreetMap Foundation, FOSSGIS e.V. – the official local chapter in Germany – and OpenStreetMap France – the official local chapter in France – campaign for free map data. We usually do so in financial and technical matters but sometimes we are forced to become active in politics to defend the project. But the directive does not mention upload filters, does it? They must have made “best efforts” to get a licence to use the uploaded content. They must have made best efforts to ensure that their platform does not publish content if copyright holders have provided them with the necessary information. If they are informed about a copyright violation, they have to remove the content, or disable access to them, immediately. Until now, platforms were excepted from strict liability if they reacted immediately to a notification of a copyright violation. This new directive would force platforms to use either upload filters or review all contributions manually. Upload filters are the “high industry standard of professional diligence”. For example, Google uses them on Youtube. What’s the problem with upload filters? These filters do not work as reliably as required. Even now, and definitely under the new directive, they tend to be too zealous, by erring on the side of caution and excluding more than they should. The operators of small and medium sized platforms will be forced to purchase the filter technology from large companies to keep up with the current state of filtering technology. This gives more power, and money, to large companies, centralising their power even more. The rules will affect any website where users can upload copyrighted content. These are not only social networks but blogs with comments and forums as well. Small and new platforms lack the required financial resources to buy the filters. They will be exempted from the first and second condition (attempt to get a license and prevent uploads of copyrighted contents) if their annual turnover is below EUR 10 million and they are less than 3 years old. But three years is a short time. If the number of users exceeds 5 million, condition 3 (prevent re-upload of illegal content) must be met. The directive aims to oppose the business model of big US companies. Indeed, the business model of Google and others is not always well aligned with public interests, but the directive will harm small and medium sized competitors, not the large ones. Why do upload filters harm OpenStreetMap? The OpenStreetMap project emphasises openness. Map changes by all users, new and experienced, are applied immediately and are provided to all other data processors immediately. The map is always as up to date as possible. OpenStreetMap records the reality as it is. Other map data providers do the same. If OpenStreetMap compared the submissions with other datasets, many false positives would occur. Our data is if it is correct, very similar to the data of other map providers. A road in OpenStreetMap has the same curves, the same name, the same speed limit. If a user uploads changes which are rejected by a filter, these changes have to be rejected as soon as possible. This requires the time of our volunteers, who would like to improve the map rather than checking whether a filter returned a false positive. If a rejected contribution and a contribution of another user edit the same object in the database, a editing conflict occurs. They cannot be solved automatically because our world is too complex. Some conflicts are not that obvious: If two users add the same recently erected building, the two of them create a new object. In reality, this is a building recorded twice in our data. If an edit by a new contributor is rejected by the filter although the edit is fine, the contributor becomes demotivated due to a lack of positive feedback. The development, setup and optimisation of the filter requires a large amount of work from our volunteer software developers. Maybe we will have to spend money to purchase services. Both the work of our volunteers and the donations and membership fees are precious limited resources which can be better spent elsewhere to take our project forward. There is an exception for Wikipedia, isn’t there? It is not clear whether the “Wikipedia exemption” would be valid for OSM and even Wikipedia does not feel confident: María Sefidari Huici, member of the board of Wikimedia Foundation, calls the proposed changes a threat for the living and free internet. The Wikimedia Foundation, the organisation behind Wikipedia, doubts that this exemption satisfies their requirements. We share these doubts. The directive has to be implemented in national law by EU member states. The implementation will not be the same among the countries. Some differences are possible. In some countries, terms like “commercial” and “business-like” are interpreted very strictly. Our data is used in commercial environments a lot. There are many companies using our data and contributing back to OpenStreetMap by developing software or paying their own data contributors – or just by making OSM available to the broad public. If OpenStreetMap becomes harder to use for commercial data purposes, due to these new restrictions, it will harm all of us. What can I do to oppose the directive? Sending emails to MEPs is not useful or effective. It is likely that would be treated as spam and/or boost the (false) impression put forward by some advocates of the directive that the folks against the directive are “Google’s bots”. You can phone your MEP and try to convince them. savetheinternet.info/contact-your-mep provides phone numbers and a filter by country of origin. Our number one request is that you join a protest. Join one of the many demonstrations or organise one yourself. There is a day of action in more then 30 cities all over Europe on 23 March. Dates and locations can be found at savetheinternet.info. The web site saveyourinternet.eu provides suggestions and support to get in touch with members of the European Parliament. If we succeed in explaining to enough MEPs that upload filters as described in article 13 are a bad idea, the Parliament can reject the article or the whole proposal. Enquiries can be answered by the Communication Working Group at press@osmfoundation.org. As the Working Group members are volunteers, we invite you first to use your favorite search engine to see if your question has been answered in our forum or mailing lists. You can also ask your questions on the forum (OpenStreetMap account required for log-in), our mailing lists and in our chat rooms. OpenStreetMap was founded in 2004 and is a international project to create a free map of the world. To do so, we, thousands of volunteers, collect data about roads, railways, rivers, forests, buildings and a lot more worldwide. Our map data can be downloaded for free by everyone and used for any purpose – including commercial usage. It is possible to produce your own maps which highlight certain features, to calculate routes etc. OpenStreetMap is increasingly used when one needs maps which can be very quickly, or easily, updated, such as ambulance services, fire brigades, humanitarian development and humanitarian crises response. This entry was posted in copyright on March 21, 2019 by OpenStreetMap. Academic Track: There will be a proper academic track, it will be announced separately! The “OSM Basics” track: We would like to welcome newcomers with contributions that get them started in the fascinating world of OpenStreetMap. These talks should specifically address the needs of people not overly familiar with the OSM ecosystem. The “Extended talk” submission type: Big ideas need time to grow. For talks in this category we will allow double the time (40 min) compared to the usual talks. Make sure to mention why your talk needs this extended space. We are looking forward to your fresh ideas and beautiful maps! This entry was posted in State of the Map on February 28, 2019 by OpenStreetMap. Applications for State of the Map 2019 scholarships are now open! State of the Map is the annual event for all mappers and OpenStreetMap users. In line with our motto “Bridge the Map”, we invite all OSM enthusiasts – whether you are a hobby mapper, a scientific researcher, a humanitarian, with an NGO or a government agency, a small business or a global company — to join us in Heidelberg, September 21-23, 2019 and strengthen existing and build new bridges. The HOT Summit, the annual gathering of the Humanitarian OpenStreetMap Team community, will also be directly preceding SotM – to enable all SotM participants to easier attend HOT Summit and vice versa – and facilitate further exchange. 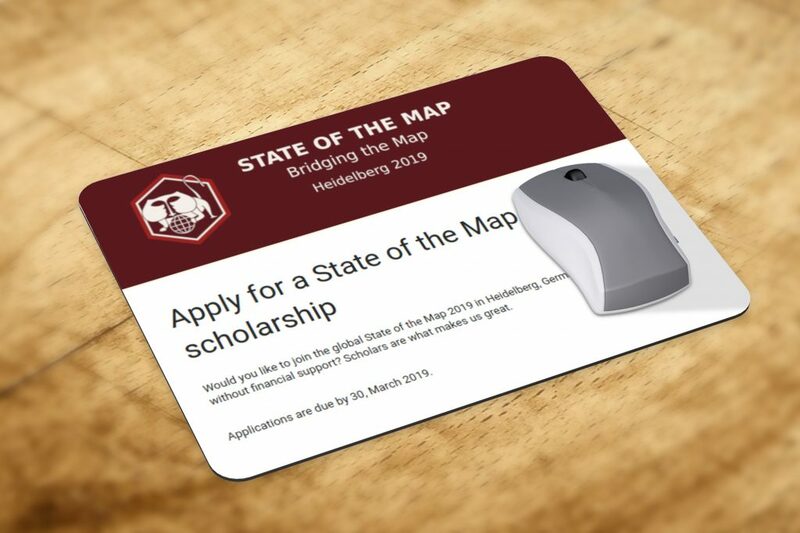 Apply now for support to join us in Heidelberg for State of the Map 2019! Here are some tips to help you complete your application. You can also check out Gregory’s post on how we selected scholars from previous year’s applicants. Select the minimum level of scholarship you need. This will help us to make the best use of limited funds and enable more scholars to join. Make sure you clearly state your visa and travel requirements, as well as potential other funding sources. Answer the question “Please describe your involvement in OSM and how will attending State of the Map benefit you, your local mapping community and the wider OpenStreetMap project” in 1500 characters maximum. Keep sentences short. 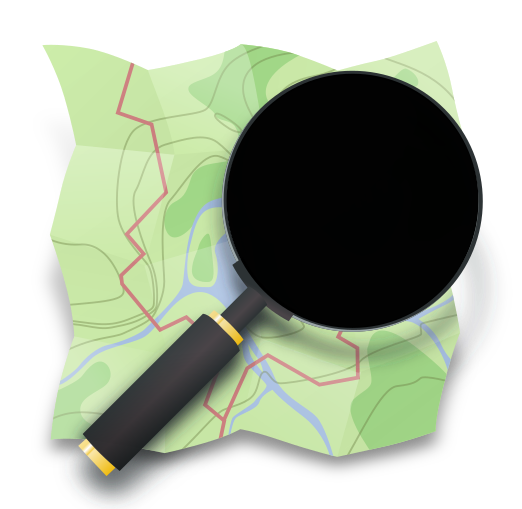 Focus on the benefits to you and to OpenStreetMap. What topics or views will you bring to SotM that are otherwise missing? What do you plan to achieve through coming to the SotM? What do you plan to do when you return home after SotM? To enable our scholars to have the chance to extend their stay for the HOT Summit, this option will also be supported through generosity of HOT Summit sponsors. Please make sure to indicate if the HOT Summit is of interest for you on the form as well. For SotM 2019 we decided to contact past scholars who might want to be involved in the review process. Twelve persons will review the applications (Thanks!). All people who replied or self-volunteered were included. Four volunteered prior to being contacted. Is the applicant part of an under-represented minority group? Are they from an under-represented location? Are they contributing to OSM in a substantial way? (Not only OpenStreetMap edits, but contributed to wiki and documentation, trainers, developers). Have they applied previously and not gotten a scholarship? Do they have a unique story or experience to share? Are they in a position to share their SotM experience with a larger group? Will their attendance benefit their local community in some way? How difficult will their visa application be? How will attending State of the Map benefit them and OpenStreetMap? You can update your application before the 30th of March. Can you support the scholarship program? 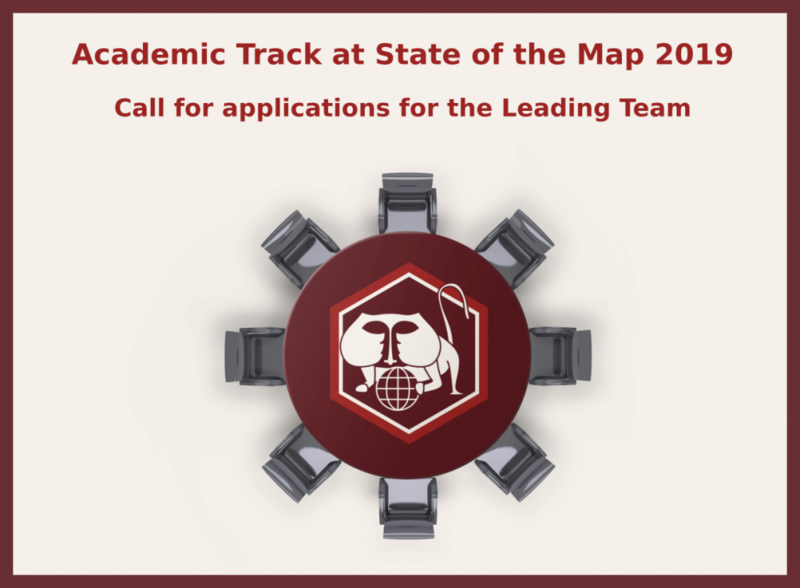 Is your company or organisation interested in sponsoring State of the Map 2019 and our scholarship program? Take a look at our sponsorship packages and email us at sponsor-sotm@openstreetmap.org for more information. 2019-03-12: This post was updated to add information about the review team and the criteria that will be used. The international State of the Map conference is organised by the OpenStreetMap Foundation. The OpenStreetMap Foundation is a not-for-profit organisation, formed in the UK to support the OpenStreetMap Project. It is dedicated to encouraging the growth, development and distribution of free geospatial data for anyone to use and share. The OpenStreetMap Foundation owns and maintains the infrastructure of the OpenStreetMap project. The State of the Map Organising Committee is one of our volunteer Working Groups. This entry was posted in State of the Map on February 26, 2019 by OpenStreetMap. Can you help make OpenStreetMap.org faster in Brazil, or Australia/New Zealand? CDN of tile delivery caching servers. A big use of the OpenStreetMap data is the web map on OpenStreetMap.org. Along with our hard working team of volunteer sysadmins who keep it going, we are helped by many donated tile cache servers around the world, which speed up the map in various regions. We are always open to more servers, but the Operations Working Group is currently looking for servers in Brazil, and Australia/New Zealand. If you or your organisation would like to donate a cache server and hosting, we’re ideally looking for a physical server or powerful VM with 8GB+ RAM and at least 146GB of storage. Read more details. Please email operations@osmfoundation.org if you are interested. Our peak Brazil traffic is currently around 65 Mbps. Our peak Australian and New Zealand traffic is currently around 20 Mbps. See the full country breakdown in bits per second. Brazil has the 10th highest traffic and is the largest country without a cache in it or nearby. Worldwide peak traffic is 2300 Mbps. Antarctica and Australia are the two continents we do not have caches on. We fully manage the software and operating system. All config is managed via our chef recipes. We also run a local firewall on each server. If physical hardware, we monitor using it SMART, hp-health, etc and report any hardware issues back to the hosting organisation. Will you help us and join the people and organisations that support OpenStreetMap? Thank you! The OpenStreetMap Foundation is a not-for-profit organisation, formed in the UK to support the OpenStreetMap Project. It is dedicated to encouraging the growth, development and distribution of free geospatial data for anyone to use and share. The OpenStreetMap Foundation owns and maintains the infrastructure of the OpenStreetMap project. Volunteers, like the indefatigable team of server administrators, keep all of this hardware working. If you can’t donate server hosting, you can always make a financial donation to the OSMF. This entry was posted in Operations on February 24, 2019 by OpenStreetMap. Right next to the old bridge in Heidelberg there lives a curious little statue – a bronze monkey. In its hand, it holds a mirror to remind anyone crossing the bridge to look back from where they came from and remember who they are. 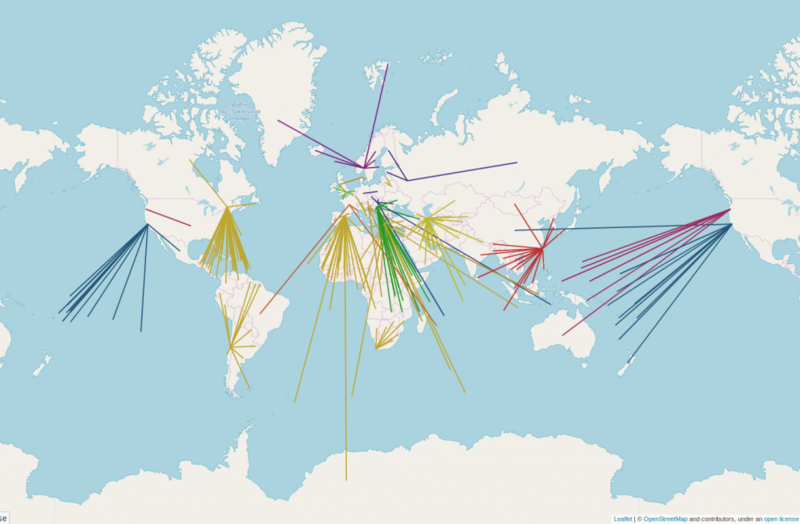 For the 2019 SotM in Heidelberg we want to take the role of that little monkey and remind everyone that no matter where we are going and what we are doing with OSM, we should never forget that we all come from the same origin: a little map that anyone can modify and use. Whether you are a hobby mapper, a scientific researcher, a humanitarian, an NGO, a government agency, a small business or a global company — we want to bridge the gap between us, or better yet, we want to Bridge the Map. Apart from the daily work of conference preparation, we have spent considerable efforts in order to use more FOSS tools. We started by moving our meetings from Hangout to Mumble. We use HOT’s Mumble server which already serves the OSMF board and other OSMF working groups. So it was already proven that Mumble is smart and works on all platforms.Our next step was much more challenging. We moved our email communication from Google Mail to the OpenStreetMap mailing list server. We couldn’t move our domain yet as there were too many constraints for a rigorous cut. So we decided to keep the Google account with the stateofthemap.org MX until everything is sorted out. At the moment the mail address “team@stateofthemap.org” is still valid, but it is forwarded to sotm@openstreetmap.org. All these lists are private. Only members of the SotM working group or the appropriate teams are able to read the emails addressed to these lists. For example progam-sotm@openstreetmap.org is read by the program committee and used for all internal communication. At the same time everybody (from outside) can write to this email address send their questions to the program committee using this email address. 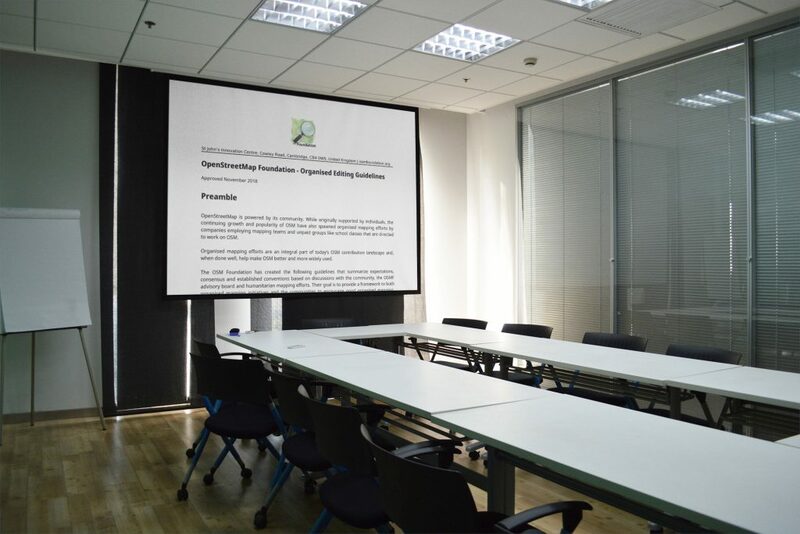 Our next step will concern the submission form for the conference contributions – the “Call for Abstracts”. We will move from Google forms to Pretalx, which is Open Source software. It is already used by FOSSGIS (the German local chapter). So we know about advantages and limitations. We still have some proprietary tools in use, and switching from a proprietary to an Open Source tool takes additional work – not only for us but also for the operations working group. In the past few months we could spend some time on this, but during the hot phase of SotM preparation there will not be enough capacity. Also, the Open Source tools are sometimes less comfortable than the proprietary equivalent, and it needs a lot of communication to persuade all the affected people to make this additional effort. The State of the Map working group supports the idea of Open Source software, and we think this goal is worth the extra effort (even if the path is sometimes rocky). This entry was posted in State of the Map on February 8, 2019 by OpenStreetMap. 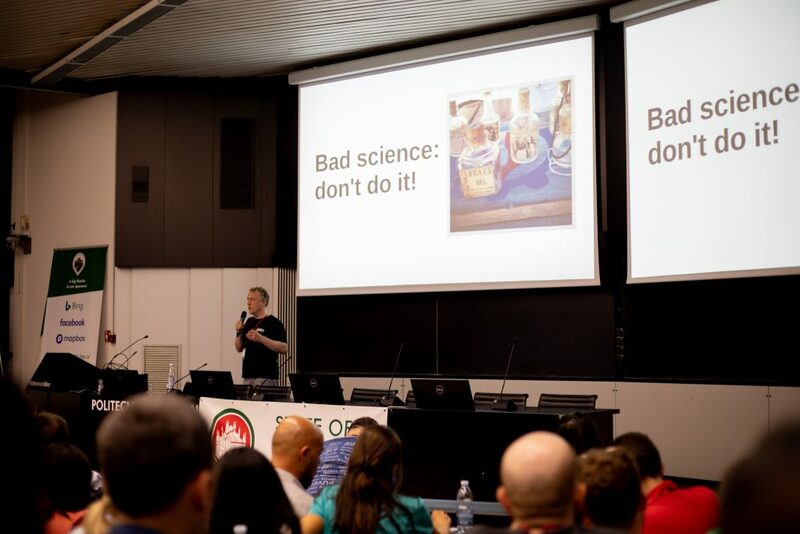 Academic Track at SotM 2019 – Let’s get started! Following the successful initiation of the Academic Track at State of the Map 2018 in Milan , this Track will be included again in the program of State of the Map 2019, to be held in Heidelberg on September 21-23, 2019. The main purpose of the Academic Track is to bring together and foster interactions between the OpenStreetMap community at large (contributors, developers, users, etc.) and the academic/scientific community of researchers from all over the world. Only applications submitted according to this procedure and only self-nominations will be considered. The deadline for applications is January 3, 2019. Applications will be assessed by the OSMF State of the Map Working Group and the Heidelberg local team. The three available seats of the Academic Track Leading Team will be assigned based on the candidate’s personal merit and according to the overall goal of forming a diverse and Interdisciplinary Team. In absence of candidates who are meeting the expectations, the OSMF State of the Map Working Group and the Heidelberg local team reserve the right to select less than three people, or nominate additional persons by invitation. Yair and Marco – on behalf of the OSMF State of the Map Working Group and the State of the Map 2019 Heidelberg local team. This entry was posted in State of the Map on December 16, 2018 by OpenStreetMap.